Valentine’s Day day is about sharing with your loved one – and for me, that involves showing off a little in the kitchen. We’re blessed to have incredible local produce here in this area. This means it’s easy to use seasonal ingredients at their best to impress your partner. When I think of this area and Valentine’s, duck springs straight to mind. It’s so hearty, flavoursome and a sure way to impress if cooked the right way. 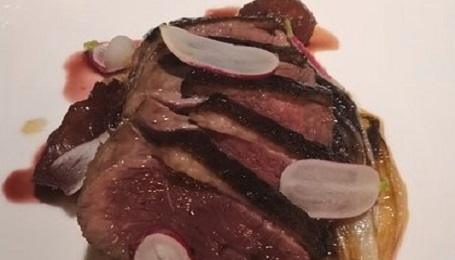 Duck is bold and rich which means it pairs perfectly with both sharp and sweet flavours. Chicory is a fabulous winter crop which is often overlooked because of its bitterness, which can put some people off. However, this dish combines chicory with a pinch of sweetness thanks to the fruity orange juice – which is also well known to go with duck. Serve this dish with a generous local red wine and, for the perfect final touch, finish the meal with my special Valentine’s Tarte Tatin (see the January/February issue of The Local Buzz). Roast duck breast, orange glazed chicory and potato sarladaise. 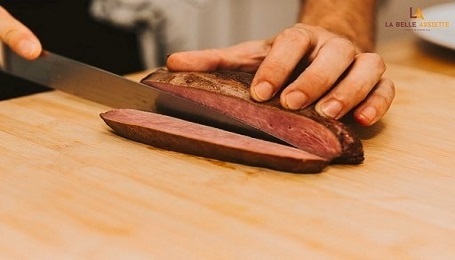 Remove any fat skin overhanging the edge of the duck breast and lightly score the skin. Make sure not to cut right through to the flesh. Lightly season the skin and set aside in the fridge. Preheat the oven to 160ºC. In a large bowl, place the duck fat, thyme and crushed garlic. Season well with salt and pepper. Then, peel and slice your potatoes very thinly and evenly (you could use a mandoline if you have one). Put them directly into the duck fat mix. Do not put them in water as you want the starch from the potatoes to help bind them together when they cook. Mix it all together, making sure that all the individual potato slices are coated in the mixture. Then pour into a small square baking tray, making sure the potato slices are laying flat. Bake at 160ºC for about 45 mins or until a knife slides in easily. Then remove and allow to chill. Remove the outside leaves of the chicory and slice it down the middle vertically. Melt your butter with a splash of olive oil over a gentle heat and place the chicory in the pan, cut side down. Increase the heat to a medium heat and cook until nicely coloured. Then turn over, sprinkle with a little sugar and deglaze the pan with the orange juice. Bring to a simmer then add 50ml of the chicken stock and boil again. Season with salt and pepper. 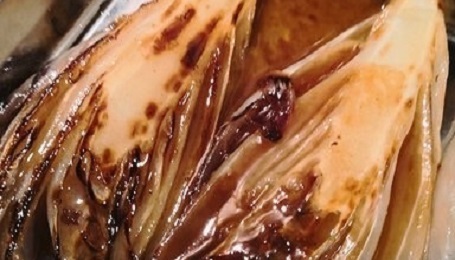 When the liquid is thick and glazy, baste over the chicory and set to one side. Place a cold pan on the stove on a low heat. 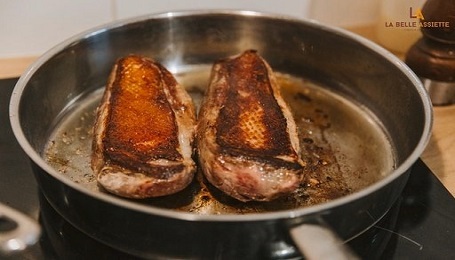 Place the duck breasts in the pan skin side down and cook slowly on a low heat. As the fat melts off, pour it out of the pan. Continue to cook slowly on the skin, until the skin becomes golden and crispy. At this point, turn the heat up and turn the duck over on to the flesh side. Cook on this side for about 1 minute until it’s coloured. Remove the duck from the pan and set aside to rest. Add the remaining 150ml of chicken stock to the pan and reduce on a high heat. Once reduced to a thick consistency, pour over the chicory. To plate, turn out you sarladaise potato on a board and cut two slices. Place them under the grill to gently warm. Then, place a slice on each plate. Slowly warm the pan with the chicory and then remove the chicory. Place a piece of chicory alongside the potatoes on each plate. Bring the remaining chicory liquid to the boil and keep warm. Now slice your duck breast, which should be a lovely pink colour in the centre. Cut thin slices, about 1cm thick, and neatly arrange the slices along the top of your potato. Then drizzle the chicory juice over the dish. Enjoy! Alan Stewart is a private chef and consultant with over 15 years of hospitality experience including Michelin starred kitchens and 5-star hotels. Now based in the Dordogne and Gironde, he specialises in seasonal, produce led cooking and is available for one-off events, longer-term hire, restaurant and catering business consultancy and cooking classes. Check out his website at www.alanstewartfood.com for more information.